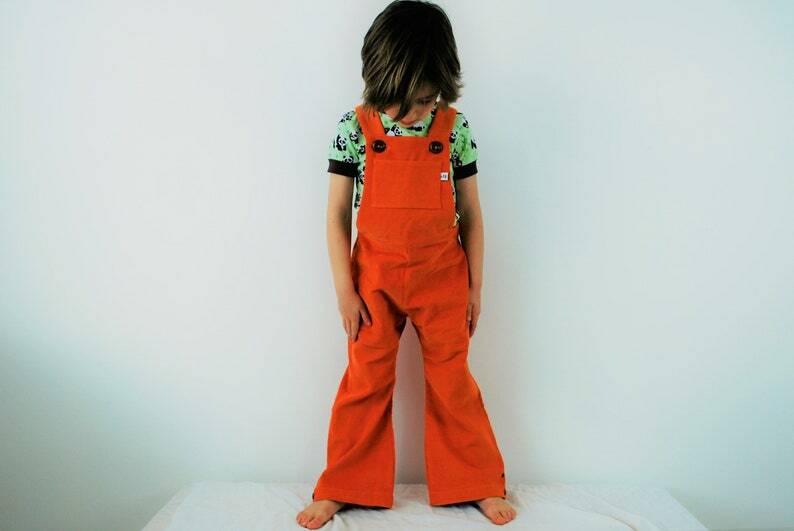 Traditional retro style flared or straight leg dungarees. 100% cotton corduroy in a vast rainbow of colour options (see last image in listing). Double button strap, plus popper fasteners at the ankles for height adjustment. Please select your size and finish style, flared or straight leg from the drop down menu at checkout. Wash at 40 degrees with similar colours and where possible line dry. All our fabrics have been prewashed prior to garment construction to avoid shrinkage and any potential running of colours, but please always take care when washing very deep colours. USA, Canada, Australia, New Zealand & the rest of the world: Approx. 2 weeks. PLEASE NOTE that international parcels can occasionally be delayed by customs and unfortunately I have no control over such delays, though I find them to be a very rare occurrence. Parcels do often arrive much sooner than anticipated but I feel that these estimates are a generous average. I do not ship with tracking as standard as this involves significant extra cost, but if you would like your parcel to be tracked please let me know BEFORE placing your order and I will let you know what options are available. Bought these as a gift for a little girl. I can't wait for her to open the package. I love them.